Share-a-holic just reported their June data related to referral traffic sources, and Tech-crunch did a nice summary report. 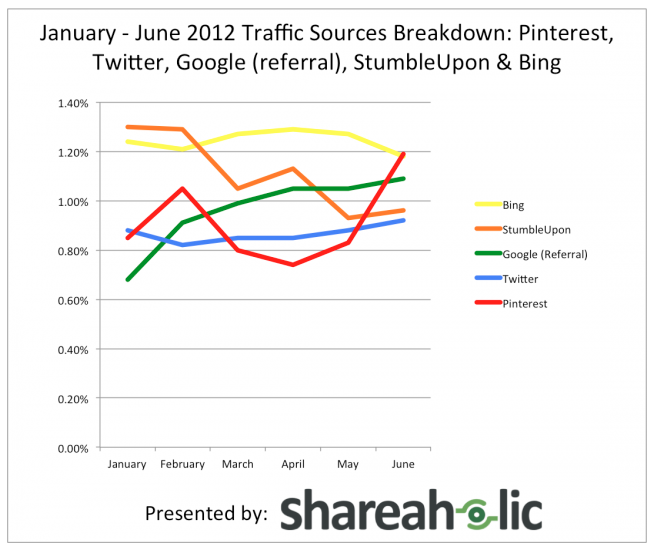 The key story – Pinterest surpassed StumbleUpon for the first time – a major achievement. In February Pinterest passed Twitter. If I am reading the report accurately, then Pinterest is now the 3rd highest referral traffic source behind Facebook and the Yahoo Network. We can personally vouch for the impact of referral traffic from Pinterest. Read our shocking results here. If you’re a marketer, and this news doesn’t get your attention, then nothing will. Qualified referral traffic is the lifeblood of any online venture and Pinterest is a referral machine.